It was a beautiful fall day here in the Shenandoah and I must admit I enjoyed gaining an hour of sleep! I had a wonderful day yesterday...I spent the day with my dear friend, Robin. She was kind enough to invite me to her house (which is a lovely house, nestled in the woods...absolutely charming!) for a day of stitching. We spent the day sharing projects, stash acquisitions and of course stitching! I took full advantage of her Keurig coffee/tea maker...what a wonderful machine! But it was the fellowship that was the most inspiring. Thanks to Robin and her enabling ways, I am going to employ The Sparrow as my 15 minute stitching project. The small motifs and fill in (grass and eventual houses) will be perfect for quick stitching. Thank you to those who left comments about my queen stitches. I must admit that I enjoyed stitching them...they are so beautiful when they are finished! Also, a big welcome to my new followers! Thank you for finding my little world interesting! Till next time! Happy Stitching! Thanks again for coming and spending the day! Being able to sit, stitch, chat, and stitch some more with was a delight! You made some good progress on The Sparrow while you were here! See you Saturday at CSS! Beautiful sampler! And very warm, gently colors! keep it up! 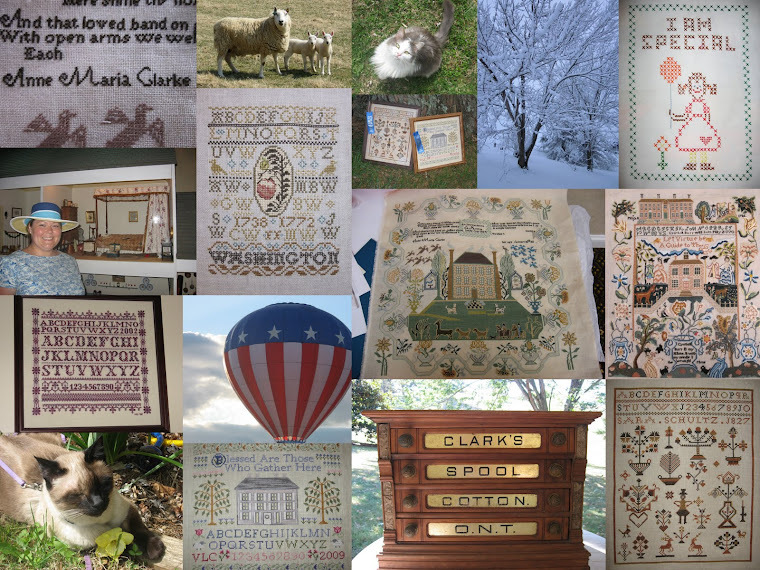 Your sampler is looking very pretty! Happy stitching to you too! I love your stitching! How nice to get together with a stitching friend. I love those days, don't you? Sparrow is so pretty! Have fun with your new 15-min strategy! Sounds like a perfect day! Love the piece you are working on, very sweet! It's always so much fun stitching with friends, isn't it! Lovely project! Sounds like you'd a lovely day! What a nice piece you're working on at the moment. Congrats on the progress and the fun. It sounds like a fun day! What great progress. I love your queen stitches, too. I was just getting into the zone with them on Victorine when I stuffed her away--I am going to have to look up your post when I pull it out again! Sparrow is looking gorgeous as are your Queen stitches. Stitching days with friends are the best. Getting together with stitching friends is always so much fun. :) The Sparrow is looking very lovely! What a fun day you spent with your stitching friend. Great progress on the Sparrow Sampler. What a pretty sampler, you have made great progress. merrywindfarm.blogspot.com. Scroll down to maybe the second post to see what I did with the loss of verse in Anne and let me know what you think. Valerie, I just discovered your blog and I am in love with it! Your projects are just gorgeous!!!! Your pictures are divine! So glad to have "stumbled" on to your place!